Inspiration for our concept came from on the song “Before I Let Go” by Frankie Beverly & Maze which is evocative of a typical African American barbecue in, say, Prospect Park. The piece would be on location, set up around the public barbecue pits and picnic tables in Prospect Park on a warm, sunny Sunday afternoon in late Spring. As observers approach, they hear the song wafting and mixing with the odors of sizzling meats and skewered vegetables. Lurking is a large bottle of barbecue sauce (or 5). The closer that the observers get the more they can make out the individual elements of the song, and as they enter the scene, they begin to notice that each element of the song is mapped to a specific area or feature of the barbecue. In this R&B pop song, the vocals are central much like the fact that the whole barbecue scene centers around the barbecue itself. 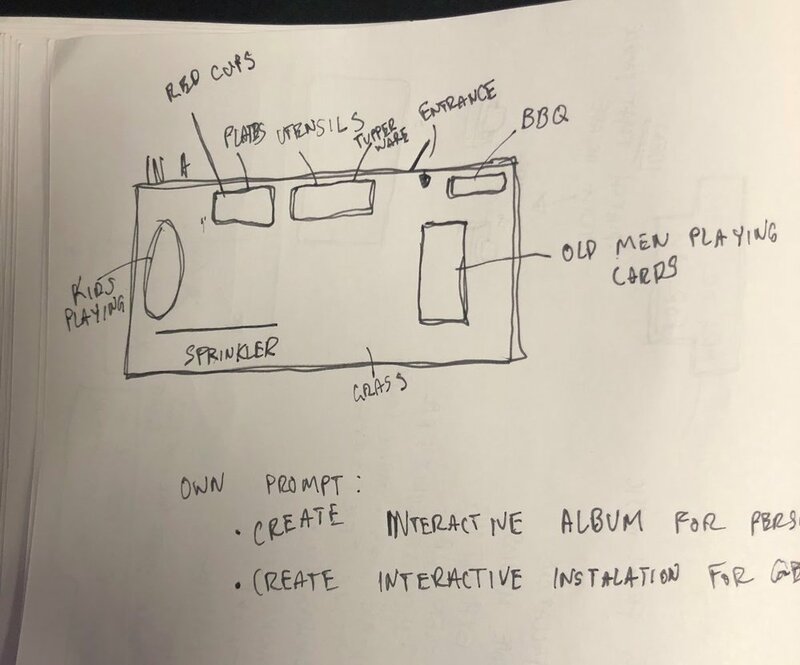 From here, we mapped the musical attributes of the song in emotional or sonic characteristics to specific features of the barbecue, where a loudspeaker playing each musical element would be placed next to each element of the barbecue. Our Oblique Strategy was “Cluster Analysis” which got us thinking of song elements in groups of rhythm, chordal, and melodic. dog sounds - background vocals?